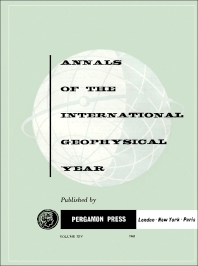 Annals of the International Geophysical Year, Volume 14: Tables of IGY Monthly Median Ionospheric Data is the second of five volumes of l.G.Y. data containing tables of monthly median values of ionospheric characteristics for the period July 1957-January 1959 inclusive. The data are extracted from booklets, bulletins and data summaries of many kinds which have been prepared at ionospheric observatories and sent to one of the Discipline V World Data Centers at Boulder, Moscow, Slough, and Tokyo. This volume is composed of 27 chapters representing the stations, which are arranged in alphabetical order. The tables for each station are preceded by some of the more important information relating to the station. This information is taken from the Ionospheric Stations Manual (U.S.R.I., 1958) that also contains hourly values of cos X and many other useful data. Both the U.R.S.I, three letter code and the C.S.A.G.I. number have been included in the tables to facilitate reference either to the Ionospheric Stations Manual or to Annals of the I.G.Y. Volume VII. This book will be of value to geophysicists, researchers, and workers in the allied fields.